It has long been apparent to me as a sexuality educator for nearly 25 years, that the topic of bisexuality and any discussion of bisexual individuals was absent from conferences, workshops and everyday discussion about sexuality. People say to “do what you love,” and I’m fortunate to have had the chance to follow my passion as a sexuality educator as it has evolved over the years. It seems as though my career in public health has involved many a “fight” for gender and sexual equality across the lifespan. It has long been apparent to me as a sexuality educator for nearly 25 years, that the topic of bisexuality and any discussion of bisexual individuals was absent from conferences, workshops and everyday discussion about sexuality. I wasn’t surprised that society wasn’t discussing bisexuality, but when I discovered public acknowledgment and discourse about bisexual people was absent even within my field of sexuality education, I felt a “calling” to destigmatize the word and address the biphobia I encountered as a result of my coming out as bisexual. As a young adult, I never really questioned my attraction. Like so many people who grow up in our heteronormative culture, I just went along with the “fact” that I should date fellas until I found someone to marry and raise a family with. Well, thankfully that script was cut short, but not until I was engaged to get married when I was in my early 20s. For reasons that I didn’t understand at the time, my fiancé broke off the engagement. Although I was heartbroken, confused and clueless about what lay ahead, I managed to bounce back, and I created a life that for many years was fulfilling and meaningful. Fast forward to my early 30s, when I attended a sexuality attitude reassessment as part of my training in the field of sexuality education. A SAR is a process-oriented, structured group setting where one can reassess awareness of their attitudes and values related to sexuality and to understand how those attitudes affect them professionally and personally. One activity we participated in was about the Kinsey Scale, which gauges a range of sexual orientations on a scale of 0 to 7, from totally heterosexual to totally homosexual. We were instructed to step on to the scale where we most identified. For the first time in my life, I felt that I had the permission to not identify as heterosexual, and that I could stand anywhere on the continuum. I don’t remember where exactly I stood, but in all likelihood it was closer to a 4 or 5. When I gave myself permission to identify as other than heterosexual, my attraction toward women really blossomed. Over the next 15 years, I dated women (all monogamous relationships — yes, bisexuals can have monogamous relationships). During that time, I identified as a lesbian, and any attraction to men was dormant (and, I thought, “dead”). Over time, the friendship evolved, and when I began to feel romantic attraction, I was determined to deny what I was feeling. After several months of working through my thoughts and feelings, and my biggest fear of being perceived as a heterosexual, I once again gave myself permission, this time to be with Rob as a couple. Being a bisexual means to me giving myself permission to acknowledge my fluidity in attraction to people across the gender spectrum. Many, many people, whether they identify as bisexual or not, experience some degree of fluidity in their sexual and romantic attractions. I think being a bisexual lets me see each person as an individual. That’s the way I want others to see me, and I want to bring visibility to bisexuality. Bisexuality means I don’t stop having attractions, caring about someone, or developing a relationship potential based on gender. Some bisexuals adopt a “fractured” identity (e.g., lesbian-identified bisexual or gay-identified bisexual) in an attempt to maintain identification with gay or lesbian communities and politics, and to acknowledge the aspects of our attraction that include the social, emotional and fantastic. I sometimes identify as a lesbian-bisexual. So, to put it another way, if someone were to ask me who am I more attracted to, I’d say women; however, I have a very narrow “attraction template” towards men. And Rob happens to fit that narrow attraction template. There are so many myths and misunderstandings about bisexual individuals. Bisexuals face not only discrimination in our heterosexist and homophobic culture, but also resistance from the LGT community, some of whom think bisexuals are “sitting on the fence.” This is an example of biphobia, which I personally experienced on several occasions. For example, when I came out as bisexual, some of my lesbian friends told me I was “going to the other side.” In truth, to be expected to “pass for straight” while having to deny your bisexuality is as painful as it is for gay and lesbians to have to live in (or go back into) the closet. Other examples of myths include assuming “bisexual” means “always available,” or being confused, or greedy; feeling like you can’t trust a bisexual person; or expecting bisexuals to minimize their attempts for visibility because their rights are not as “important” as lesbian, gay, and/or transgender equality issues. What is the best thing about being bisexual? Having the opportunity to bring visibility to the invisible and to create opportunities for dialogue and understanding about the “realities of bisexuality” — which often means dispelling common myths. I consider myself fortunate to have a partner who is one of my best allies in creating awareness and starting a dialogue about bisexuality and bisexual people. Terri Clark has been doing work in health education, training, and facilitation for nearly 25 years, and is currently the coordinator of prevention services at ActionAIDS. Terri is a member of Widener University’s Consortium on Sexuality and Aging, and an adjunct instructor at Arcadia University. 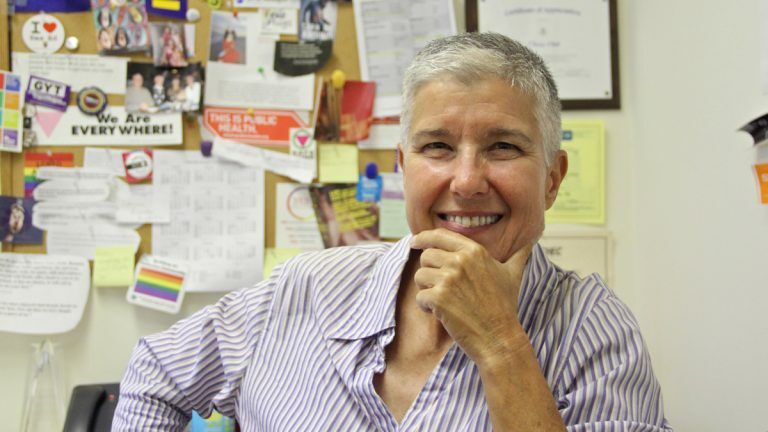 She is a certified trainer with the National Resource Center on LGBT Aging and serves on the American Society on Aging’s Leadership Council of their LGBT Aging Issues Network constituent group. She has developed a college course on LGBT issues and has presented at numerous conferences and community events on bisexuality. She is the author of “What’s Your BiQ,” published in the American Journal of Sexuality Education. Throughout her career in public health, she has been an advocate for gender equality and expression of sexuality across the lifecycle.